On July 28, Apple heiress Laurene Powell Jobs bought a majority stake in The Atlantic. It’s the latest media purchase by the billionaire class, a group that includes Amazon founder Jeff Bezos (the Washington Post), Boston Red Sox owner John Henry (the Boston Globe), billionaire Glen Taylor (the Minneapolis Star-Tribune) and casino magnate Sheldon Adelson (the Las Vegas Review-Journal). Instead of being in thrall to these benefactors, it’s important to redouble efforts to truly democratize the ownership and funding of our media system. Some have praised this growing trend, arguing that wealthy individuals are journalism’s last, best hope. And there are notable cases of rich philanthropists, like Pierre Omidyar and Gerry Lenfest, making significant donations toward public service journalism. Nonetheless, potential hazards arise when news outlets increasingly rely on private capital and billionaires’ largess. Private ownership of news organizations is, of course, nothing new. Since at least the late 19th century, most major U.S. magazines and newspapers have been owned or controlled by wealthy individuals or families. Often these owners distinguished themselves by their commitment to journalistic excellence: at The New York Times, the Ochs-Sulzberger family; at the Los Angeles Times, the Chandlers; and at the Washington Post, the Grahams. In the magazine world, Condé Nast, privately owned by the Newhouse family’s Advance Communications, continues to produce magazines highly regarded for their journalistic rigor, from The New Yorker to Wired. Between the 1970s and early 2000s, however, media companies increasingly became publicly traded stock corporations that often expanded into large chains. Gannett, owner of USA Today and over 100 other daily newspapers, and Sinclair, proprietor of 173 television stations, are currently two of the largest publicly traded media companies. In contrast to a private company – which can forgo profits if it chooses – a publicly traded company has obligations to maximize shareholder value. Emphasizing profitability often comes at the cost of professional excellence or civic commitment, even at media companies like the Washington Post, where the founders retained control of voting stock after going public in 1971. So compared to Wall Street control, private ownership has many potential advantages. As Bezos has demonstrated, a private owner can absorb short-term losses in service of long-term gain. While most news organizations are still in austerity mode, the “new” Washington Post is increasing staff and budgets. Many believe it’s also dramatically improving its quality and impact. How benevolent is the billionaire model? But private ownership is no guarantee of either commercial or professional success. And not all private owners are the same. Today, one of the fastest-growing forms of private media ownership is the investment company, linked to hedge funds or other forms of private equity. These companies are just as focused on profits as a publicly traded firm – and perhaps even more willing to close down a media outlet when its economic performance is sub-par. The largest investment groups include New Media/Gatehouse (125 daily newspapers, now larger than Gannett), Digital First Media (62 daily papers), and Tronc/Tribune (owner of the Chicago Tribune, Los Angeles Times and 17 other dailies). Moreover, what might be called the “benevolent billionaire model” for supporting journalism begs the obvious point that not all billionaires are benevolent. Exhibit A is Sheldon Adelson, the casino mogul and conservative activist who bought the Las Vegas Review-Journal in 2015. He kept the purchase secret at first, and his representatives reportedly pressured the newspaper’s staff to cover Adelson and his allies in a positive light. Notorious press barons of yore such as William Randolph Hearst and Robert R. McCormick often used their papers to push far-right agendas, including admiration for Adolf Hitler and advocating for strict isolationism. Photo of Jeff Bezos by Steve Jurvetson and used here with Creative Commons license. In more subtle ways, private ownership also raises concerns about partisan bias, self-dealing and lack of transparency. Donald Trump has exploited these vulnerabilities by posting tweets attacking the “AmazonWashingtonPost” and has threatened government anti-trust investigations of Amazon to try to intimidate Bezos. Though Trump’s motives are suspect, the concern is valid: As Amazon gains market share in industry after industry, the potential for the Washington Post to have serious conflicts of interest increases exponentially. 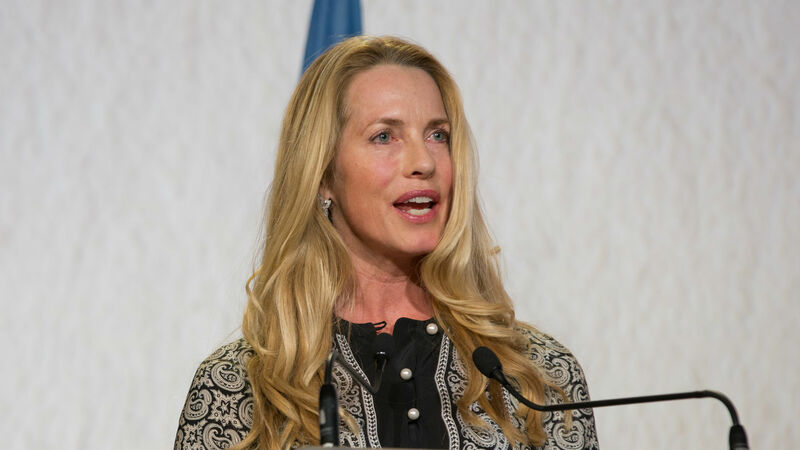 Laurene Powell Jobs’ purchase of The Atlantic via her Emerson Collective (a nonprofit limited liability company) is comparable, in some ways, to the Poynter Institute’s ownership of the Tampa Bay Times. In both cases, nonprofit organizations are overseeing entirely commercial news outlets. The difference between Poynter and Emerson lies in their missions. Whereas Poynter is devoted to nonpartisan journalism education and research, Emerson’s self-proclaimed mandate encompasses advocacy around education, immigration and the environment. Jobs has moved to the forefront of efforts to dramatically transform American education. Will she see The Atlantic as another vehicle for her to promote these views? Of course, The Atlantic isn’t a newspaper with any pretense of objectivity. It’s a magazine, both online and off, with a point of view that also provides space for other views. Like the Washington Post, it’s been profitable in recent years. With attention-grabbing journalism and skillful use of social media, The Atlantic is netting significant earnings onlinewithout cannibalizing its print magazine, whose circulation is growing as well. Behind the scenes, The Atlantic also generates revenue from organizing corporate and government forums and special events. What about the public interest? In fact, The Atlantic and the Washington Post are the bright and shiny faces of an increasingly oligarchic media system in the U.S. The oligarchs’ values and priorities, however, may not align with democratic objectives. Their business model – and definition of journalistic success – tends to exclude audiences or issues that cannot be monetized. High-end advertisers favor content that appeals to high-earning demographics, which can skew coverage away from concerns of the working class and poor. So instead of reaching out to underserved readers, these billionaire-owned news organizations may exacerbate economic and racial divides by privileging views and voices more in line with higher socioeconomic groups. We shouldn’t be surprised: The biggest beneficiaries of a highly stratified economic system are unlikely to take the lead in addressing inequality. Under Bezos’ stewardship, the Washington Post was conspicuous for its harshly critical coverage of Bernie Sanders’ inequality-focused candidacy. Powell Jobs is no doubt sincere in her reformist zeal, yet her single-minded push for educational “innovation” conveniently shifts attention from the massive imbalance in resources available to low-income versus high-income school districts. While the new media oligarchs might value profits less than their Wall Street compatriots, they may be more determined as “thought leaders” to shape – and limit – public policy debate. While there have certainly been positive aspects to Amazon CEO Jeff Bezos’ purchase of the Washington Post, he’s also opened up the broadsheet to charges of bias and conflict of interest. Instead of being in thrall to these benefactors, it’s important to redouble efforts to truly democratize the ownership and funding of our media system. One way is to increase government support for U.S. public media, the worst-funded in the Western world. Research shows that public media tend to be more independent, ideologically diverse and critical of dominant policy positions compared to commercial news organizations. Furthermore, strong public media systems correlate with higher political knowledge and democratic engagement. Public media are also the best positioned to withstand various kinds of market failure, which will likely only worsen in the coming years. Numerous sources can help fund public options and foster structural diversity in our media system, ranging from spectrum auctions generating revenue to support local journalism to having Facebook and Google pay into an investigative journalism trust. Tax incentives and policy protections can ensure a commitment to public service and bottom-up governance by citizens and journalists instead of absentee owners. Indeed, one possible silver lining to commercial journalism’s struggles is a renewed search for structural alternatives, especially public and nonprofit models. These are obviously long-term solutions. In the meantime, a truly diverse media ecology could have public-spirited oligarchs playing a positive role. But when they become the dominant players – as is increasingly the case today – they may threaten, more than strengthen, our democracy. Rodney Benson is Professor of Media, Culture and Communication at New York University. Victor Pickard is Associate Professor at the University of Pennsylvania.